The title of tonight’s half term midweek Drake Towers Cinema 7pm special showing (or to give it its full moniker: One Direction: This Is Us), sums up tonight perfectly. My 15-year-old daughter had her new friend round. During the hugely-anticipated visit, her 13-year old New Best Friend was treated to games, tea, the 1D film, carefully weighed-out popcorn, and a sleepover. 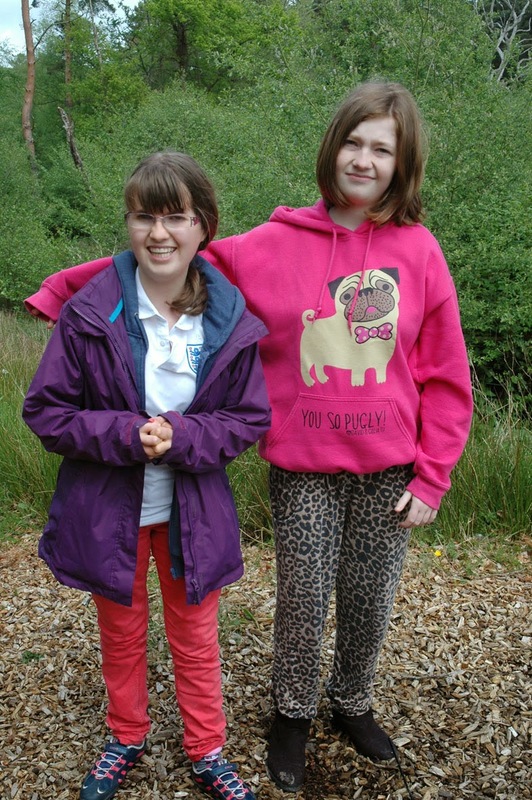 They met three weeks ago, on a Prader-Willi Syndrome Association family weekend. They clicked, in a shy/not-talking too much/chatting when prompted/content/sitting near each other/smiling/stealing glances/oddly sociable/PWS way. Today's half term fun and frolics were tentatively arranged. First, I had a grand old chinwag with PWS NBF’s mum, while the girls went upstairs to check out the sleeping arrangements, under attack from Annoying Little Brother, who was in Full On Show Off Banzai mode. Then Mum nipped off home, with us both ridiculously content at just not having to bother with the usual PWS conversation about food, and portions, and banned grub, and acceptable nosh. I knew. She knew I knew. It wasn’t a thing. Board games were played: our visitor brought Scattergories, where spelling and quick-thinking were required. It was a little challenging for both of them, but they piled in willingly, managing to come up with a celebrity and a herb beginning with O: Olly Murs and Oregano. (Or was it the other way round?) Next, we lightened things up with a game of Ladybirds, which is aimed at 3-7-year-olds, and involves rolling a dice and turning over cards, to find, predictably enough, ladybirds. They shrieked with delight when they got three bugs on a leaf, and giggled and groaned when they got the worst cards: "I've got a none! Oh no, another none!" I then had two kitchen assistants whilst making the tea, which was a triumph, of course. (If ever you want to be complimented on your cooking, invite someone with PWS round. The pair of them were so appreciative of the Hairy Bikers’ diet enchiladas, that I’ve stuck four Michelin stars on my front door). The successful meal prompted a dreamy discussion about food, which lasted a good half hour. Finally it was onesies on and 1D on. My daughter has a loud, almost hysterical, nasally, honking laugh, which is one of my favourite sounds in the world. Her NBF has one just like it. They’d been duet honking throughout the evening. Only now it wasn't laughter, it was the glorious honk of 'singing' along to every word of every song - one of the sweetest sounds I’ve heard, despite it bridging the gap between Simon Le Bon and a braying donkey. Which, as you well know, is a very narrow gap. Meanwhile, my husband had been charged with keeping annoying little brother out of the way. He failed. The three foot anarchist, watching Harry Potter in the other room, had obviously picked up some lessons in mild swearing from Ron Weasley, which he felt he needed to share. He broke ranks near the end, bursting through the door, cocking his head to one side, and yodelling the immortal lyric-mangle: “You light up my life like no bloody hell! You don’t know you’re bloody hell!”. I looked at them both, as the world’s worst minder scooped the potty-mouthed usurper from the room and took him to bed for a stern talking to. The girls sat there, giggling, slightly shocked, my daughter and her new buddy, like peas in a pod. They’re upstairs, fast asleep, in my daughter’s bedroom, having cleaned their teeth with their new 1D toothbrushes (my girl's presented to her by her NBF as a surprise gift). As Ron Weasley and Harry Styles might jointly say: bloody hell, they don’t know they’re beautiful. Video is One Direction: What Makes You Beautiful. Nah, not really, I've just sat through the blinkin' film, I'm not subjecting you to it, too. Here's Nick Cave & The Bad Seeds - There She Goes, My Beautiful World. Prepare yourself for a push and a shove. 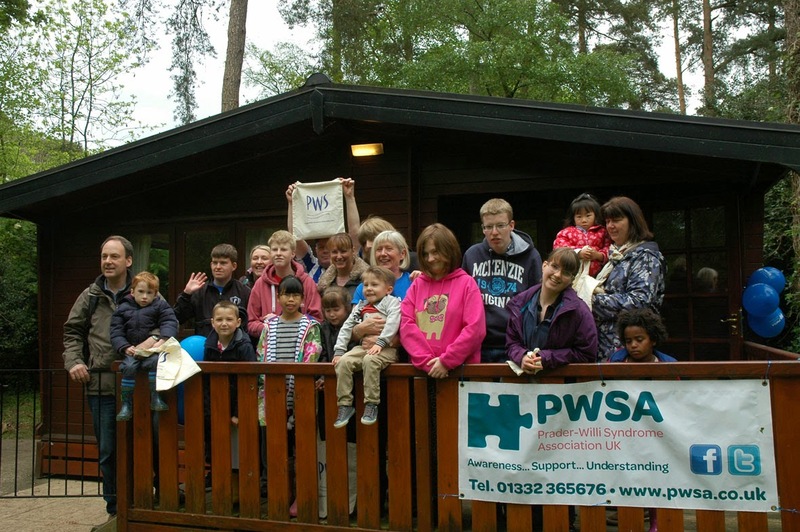 This week is Prader-Willi Syndrome Association (UK)’s PWS Awareness Week. Families of children and adults with PWS have been talking about the rare chromosome disorder in their workplaces, at schools, and all over social media, in an effort to raise its profile. Lots of people have gone to a lot of effort organising a variety fundraising events, and they should be saluted. But I am not skydiving. I’m not going to bungee jump. I’m not baking, dieting, being silent, walking, running, or trekking along the Great Wall Of China. I’m not making a Just Giving Page. I’m not setting a target and I’m not drawing a thermometer. I do not want you to sponsor me. All I’ve done this week is write a blog entry a day instead of one week or so, like I usually do. I really am a right lazy arse. But here’s the thing. If you’re reading this, it means you probably park your arse on my lazy arse blog every now and again. So I’m just asking for a little favour. An annoying Public Radio kind of cash-based favour. Yes, you are being chugged*. (*This means Charity Mugged, apparently, not gulped down in one like a Yard of Ale. And nope, I’m not doing a sponsored Yard of Ale, that’s just a hobby). This is what I'm asking: If you want to, if you are able to, please make a donation to the Prader-Willi Syndrome Association UK. Go directly to their donation page, and give them some dosh. I’m cutting out the middle man, here. Fundraising websites won’t slice off any percentages, I don’t need any money to pay for goose fat to slather all over me as I swim the Channel, and I don’t want to know who’s donating and how much. I cannot adequately tell you how important the work this charity does is to people with PWS and their families. The money will go directly to the PWSA, which means it will directly help people with Prader-Willi Syndrome. People like my daughter. Look at her, up there, on the bouncy castle. Cute, isn't she? Don't force me to use my back-up picture of baby otters. This week is PWSA (UK) Awareness Week. The Prader-Willi Syndrome Association (UK) want to spread the word about the rare chromosome disorder. They want more people to know about the syndrome, in an effort to allow children and adults with PWS to be understood and accepted, and to make more people across the country aware of what the condition means for PWS people and their families. “Talk about PWS” is the strapline. 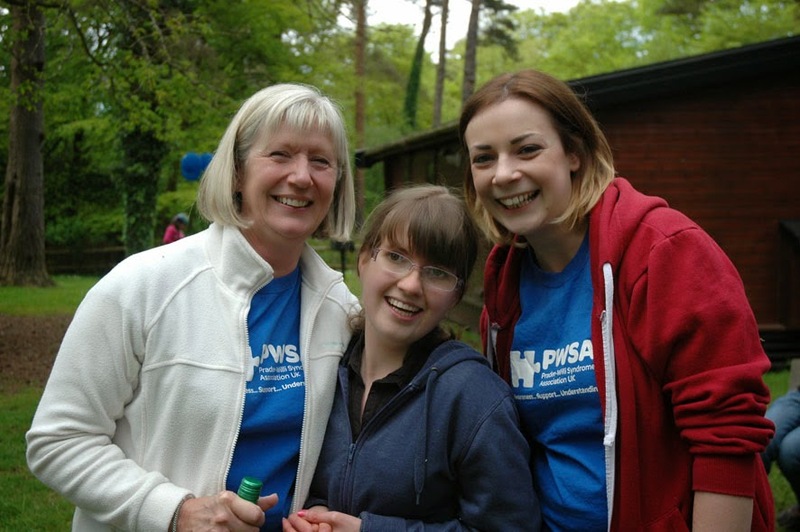 Today the PWSA (UK) is talking about Families, in particular PWS family events organised by the association and its members around the country. Without wishing to sound like a bigamist in the confessional box, I want to talk to you about my other family. We were slow starters when it came to meeting 'people like us' with Prader-Willi children. I was fiercely protective of my new baby and unsure and frightened of the new world of disability we’d hurtled into. I bunkered down, built up the defences. We’d face this. We’d deal with this as a family. Our family. I should have raised my head above the trenches sooner. 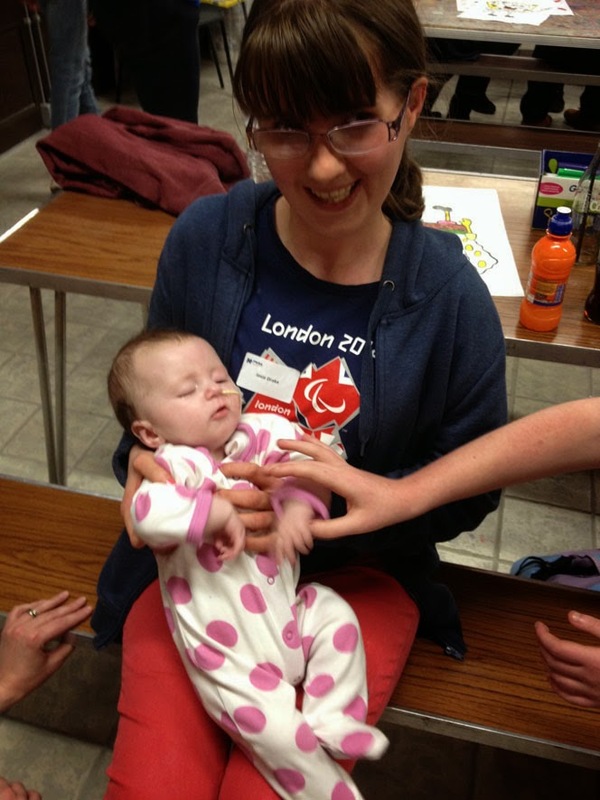 I should have been as brave as some of the parents I've since met, bringing their tiny new babies along to PWSA events. What I think they've realised, sooner than I ever did, is that there is a whole new family out there. Other parents facing the same challenges as us. Other people whose babies had been born with a chromosome glitch that would have a dramatic effect on their lives. The same glitch. The drama their child has been cast in might not be exactly the same show as ours, but it was created by the same wonky production company, with many similar plotlines, belly laughs, and cliffhangers. Our new family is our PWS family. Some of them we’ve read about and chatted to on Facebook and Twitter and online blogs. Some of them we’ve been to parks and picnics with, had Christmas parties with, spent a weekend away with (thanks to the PWSA UK, who, by the way, are very much included in this family). Some we’ve never spoken to, some we’ve chatted to only briefly, some we’ve talked for hours with. Some are strangers, some are becoming friends, some already are. Knowing them, meeting them, gives us the chance to feel normal, to be understood without the need for explanation. Most of all, it give my daughter a sense of belonging, friendship, fascination and fun. 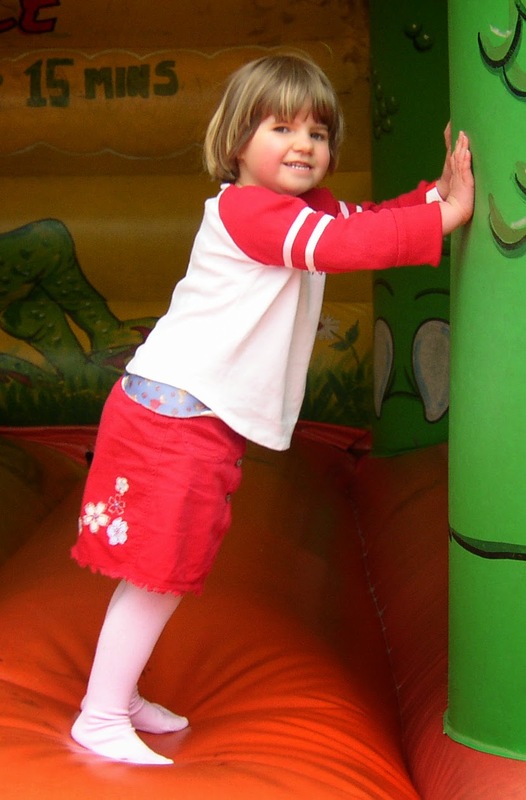 Meeting other children with PWS is her favourite thing to do, apart from eating. When we’re with our PWS family, we don’t need to add the ‘apart from eating’ bit, because they get it. They live in an ‘everything comes second to eating’ world, too. We’re not all the same. We don’t agree on everything. Some of our PWS family have the positive answers we’re searching for, others have stories we’d rather not hear, but need to. Some lead lives that mirror ours, some take wildly disparate turns. Our children are completely different at the same time as being incredibly alike. What we are not, is alone. Today the PWSA (UK) is talking about Adults. Does your son or daughter live at home or in supported living or residential care? How is it working out? Today’s topic is the one. The one that gets me. If I had to plot a graph of my fear levels regarding PWS, it would be creeping up and up with every birthday my daughter celebrates. When your Prader-Willi child is a baby, all floppy and helpless and ‘other’, you’re shocked and terrified. Your life has taken a wrong turn. It takes a while for you to realise that the wrong turn, unlike the ones in films, doesn’t lead you over the edge of a cliff or into cannibal-infested woods - it takes you pretty much where you wanted to go, just the long way round. So from initially stratospheric fear levels, my graph dropped to low grade background worrying once I got to know my daughter and her charm and grace made her one wonky chromosome seem less important. There have been spikes along the way: I’ve never known real terror until those hours I sat waiting to find out if a 10 hour spinal fusion operation had been successful and safe; I’ve never felt as frightened and helpless as when she raged and swore in the middle of the night as her then undiagnosed mood disorder briefly changed her into an almost unrecognisable cuckoo in the nest. But life, for the most part, has been lighter on the jitters and heavier on the jollies than I ever expected. And yet. And yet. Adulthood is looming. I’ve just read the stories shared by parents of PWS adults today, as part of the awareness week, and I’m crying. At the honesty, bravery, resilience, and often the sadness portrayed in their tales of the difficulties that their families have had to face, are facing, and are yet to face. Problems with food and weight, mental health, frustrations over jobs, routines, friends, a social life, with living. An adult with Prader-Willi can find living in residential care hugely difficult. They can also find supported living hugely difficult. Living at home can also be, you guessed it, hugely difficult. They are a person, with hopes, and dreams, and tumultuous emotions which they cannot control. They need structure, they need stimulation, they need a proper, satisfying, fulfilling shot at life. And it is so hard to find a place for them in the world, where they can be happy and healthy. My girl is only 15. I believe staying on at her school until she is 19 will work well for her. I believe this, but I don’t know it. After that, she may go to college, but finding the right course, the right supervision, the right help, won’t be easy. If it goes well, that will take her up to 22, and then after that? What then? Where then? How is it going to work? I have to think about these things. The line on the fear graph is looking mighty steep, but I have to scale it. I’m going to need some grappling hooks, some thermal undercrackers, and, hell, maybe some Sherpas. Today the PWSA (UK) is talking about Education. What experiences do parents want to share about their PWS child's education? Some parents go bananas trying to get their kids into a good school. They run themselves ragged hot-housing little Jocasta into a frenzy, desperate to bag a galaxy of A-stars and bask in their reflected glory. I don’t think I was ever going to be one of those parents. All I want is for my children to learn, to do their best, and to be happy. (For one horrifying moment, I just had a strange urge to print these three aims on a picture of a sunset, or a kitten, or a kitten in front of a sunset, and post it as a motivational Facebook inspiration status. Don’t worry, I slapped myself in the face, and the feeling passed). Children with Prader-Willi Syndrome have a lot to deal with. As well as the insatiable appetite and the need for supervision around food, they usually have some form of learning difficulty and are emotionally immature. This means that you discover a whole new side to the education system that you barely knew existed: the world of Special Needs education. It’s a world of confusing codes, acronyms, and jargon. You’ll be meeting SENCOs, agreeing IEPs, arguing over SENs, and trying desperately to resist the urge to yell FFS. It’s hard, trying to find the right school. It’s tough deciding between special needs education and mainstream inclusion. You discover how local education authority’s finances directly affect the provisions put in place for your child. You realise that you need to be a squeaky wheel, and to question decisions. You learn the value of good advice from people at the Prader-Willi Syndrome Association (UK), fellow PWS parents, and other organisations. You realise that the perfect setting for your child does not exist, but good ones do, and that as your child grows and changes, that good place may not be the right place any more. You realise the importance of real, robust communication between you and your child’s school. You wish that the ‘tradition’ of kids bringing cakes or sweets in on their birthday had never started, but you plan for it by giving your child’s teacher a bag of alternative treats. You worry. You watch. You listen. You learn, often by your mistakes. Then you move house, and have to start all over again. The people who make all this bearable are the good ’uns. The teaching assistants who seem to get your child, and the ones that think ahead and come up with cunning plans when food is on the curriculum, and somehow manage to persuade my girl that PE is fun. The teacher who calls the PWSA for advice and help, and emails you in the evening about a problem she wants to solve. The school staff who give up their time to make the special school show the hottest ticket in town. The people who connect. The people who can sometimes send my extraordinary, wonderful, happy, anxious, daughter home with her chest puffed up with pride. It’s not every day, but every day that it happens is glorious. Video is Public Service Broadcasting - Inform, Educate, Entertain. "It's tiring all this stretching up for something that's just out of reach. But I'll get it. After all, what I want isn't as easy as all that." Today the PWSA (UK) is talking about healthy living. Do parents have any tips about helping a PWS person eat healthily? Well, in our case, it’s all to do with subterfuge. Don't get me wrong, you have to be honest with a person with Prader-Willi. They have to know that they need to try their best to abide by some pretty strict rules when it comes to food, despite their constant hunger, or actually because of their constant hunger. My daughter knows she will become ill if she was allowed to eat whatever she wanted, because when it comes down to it, people with PWS want everything. So whilst I am brutally honest with her about the whys and wherefores, I use a shitload of subterfuge when it comes to the hows. I employ deceit, tricks, manipulation, and all kinds of underhand shenanigans to help my daughter eat healthily. (Plus my magic handbag, containing emergency rations for those thankfully rare, but potentially explosive, times when circumstances mug you and suddenly find yourself not where you are supposed to be at an allotted mealtime). In summary, it pays to be sneaky mother. My daughter’s main meals are served up on a side plate. The portion is a good size and fills the small plate right to the edges. I’m convinced this makes her feel as if she is getting a bigger portion. * (*Note to self regarding bigger portions: perhaps I should get my husband to wear smaller underpants). There have been occasions when my daughter has dropped a spoonful of rice onto the floor. There have also been occasions when my son has done a fusilli smash and grab raid from his sister's plate and nicked a single piece of pasta. My daughter calmly and methodically devours every last crumb of every meal. If she feels diddled out of just one flipping fusilli, then meltdown can ensue. Hold a spoonful back and have it ready on the bench, for when a replacement is needed quickly. You know those little boxes of raisins? You can split the contents in half and stick one lot in an empty box. That way two ‘boxes’ of raisins have the same amount as one. Also, Easter egg packaging can be sliced open and the chocolate replaced with a plastic egg filled with no-sugar, low fat treats. (Bonus: the slicer gets to dispose of the chocolate egg in whatever way they see fit). If they can’t have a Magnum ice cream, they can have a mini-milk lolly instead. If they can’t have a Mars Bar, they can have a Jaffa cake instead. Yes, the important stuff is the healthy, low fat meals, but PWS people can still have treats - they just need to be planned and accounted for in your daily food routine, and you just need to learn what’s low calorie and low fat and can be given to your child instead. Especially if you’ve spent several years explaining that when you cut something in half, yes, there’s TWICE as much. I probably shouldn't have told you that last one. Today is the start of PWSA UK Awareness Week. The Prader-Willi Syndrome Association (UK) want to spread the word about the rare chromosome disorder. They want more people to know about the syndrome, in an effort to allow children and adults with PWS to be understood and accepted, and to make more people across the country aware of what the condition means for PWS people and their families. 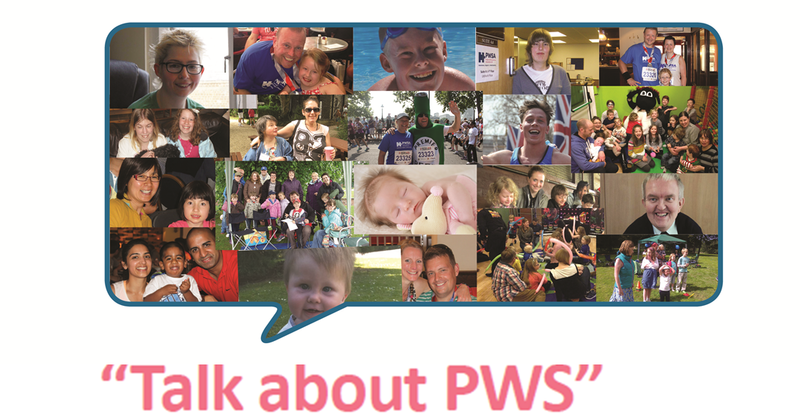 “Talk about PWS” is the strapline. If you’re a regular reader of this blog, you’ll know I need no encouragement on this front. (‘Shut the flippety flip up about PWS’ would be a harsher, but not totally uncalled for, tagline for me and my ramblings). Today, the PWSA (UK) is talking about...new diagnosis. If you could meet yourself now, what message would you give yourself? Because in the beginning, in the shocking, frightening, moments when doctors pull the rug from under your feet and tell you your child is disabled, you feel unlucky. Desperately, horribly, unfairly unlucky. It changes. One day, that thought isn’t there any more, or at least it only surfaces fleetingly, when you occasionally reach the end of your surprisingly long tether. Once you understand more about the sheer number of things that can go off-plan when you’re talking about the incredibly complicated blueprint of a human being, once you meet other parents dealing with other syndromes affecting other children in other ways, once you see the challenges other parents with non-disabled kids can face, too, “Why me?” is sanded down, and re-chiselled in its place is a different phrase: “Why not me?”. If it wasn’t me, I wouldn’t have my daughter. And life would not have been the same. It wouldn’t have been as good. That’s what I’d tell me. We’re back home from our first ever Prader-Willi Syndrome Association (UK) Holiday weekend, and we are kernickity-knackered. It was a certified hit with our daughter. So much so, she only allowed us to come home today as planned (as opposed to many of the families who were staying on for three nights, not two) after being assured by independent* arbitrators that she was in no way missing out on any activities or get-togethers tonight whatsoever. (*I say ‘independent’, when what I actually mean is people who were willing to tell a white lie when winked at meaningfully by me out of my girl’s sightline). We got to cuddle some gorgeous PWS babies, brought along by some incredible mums braver than I ever was at that stage of my daughter’s life. I was too frightened and shell-shocked to throw myself into the PWS community that early - with hindsight, it would have done us the world of good. The cuddling gave me the chance to confirm my hypothesis that cradling a soft, beautiful, PWS baby is the most calmingly hypnotic experience you can have, and a surefire way to disappear time. We played and chatted with some crawlers, shufflers, toddlers, tinkers, teenagers, mums and dads and nans and grandads and careworkers and friends. We coloured, we did some “wake and shake” exercises, we adventure-playgrounded, we wildlife-parked, we healthy-barbecued, we picnicked, we nature-trailed, we talked ourselves hoarse, and we snuck in a few cheeky wines. My girl gave two fellow teenage PWS girls the One Direction Instant Kudos Quiz: “Do you like them? Who’s your favourite?” Both came up with the compulsory correct answers: “Yes!" and "Harry!”. Eve, aged 13, turned out to be a real kindred spirit who lives only about an hour from us. Sunday walks are being arranged, and a half term sleepover is all but finalised. My boy fell in man-love with the punk-loving brother of a PWS girl (whose fashion sense he is now desperate to copy). I told him he’s not getting his nose pierced, mainly because he is blinking well only five years old, but I did agree he could spend his saved pocket money on a Sid Vicious replica padlock neck chain like the one his new cool dude friend was wearing. This was a compromise I felt necessary to avoid Anarchy In Our Own Particular Part Of The UK. Maggie and Erin, from the Prader-Willi Association, worked from morning until night, hosting, catering, introducing, chatting, smiling, and generally being superheroes. My daughter (with a little whispered prompting from me) stood up in front of everyone and thanked them both for all their help, hipp hipping some hoorays, and leading a round of applause. Now, a few hours later, after a relatively painless journey home, which was only interrupted by a donkey jam on the winding New Forest roads (Eeyore really has no understanding of the Green Cross Code), I still feel like cheering. My daughter felt part of something, not apart. She was like other people, not unlike them. She made new friends who shared something special with her: their Prader-Willi Syndrome. It doesn’t define them, but it does unite them. Forget Manchester City winning the Premiership - Prader-Willi United is top of the league. And it was this weekend’s away form that won it. 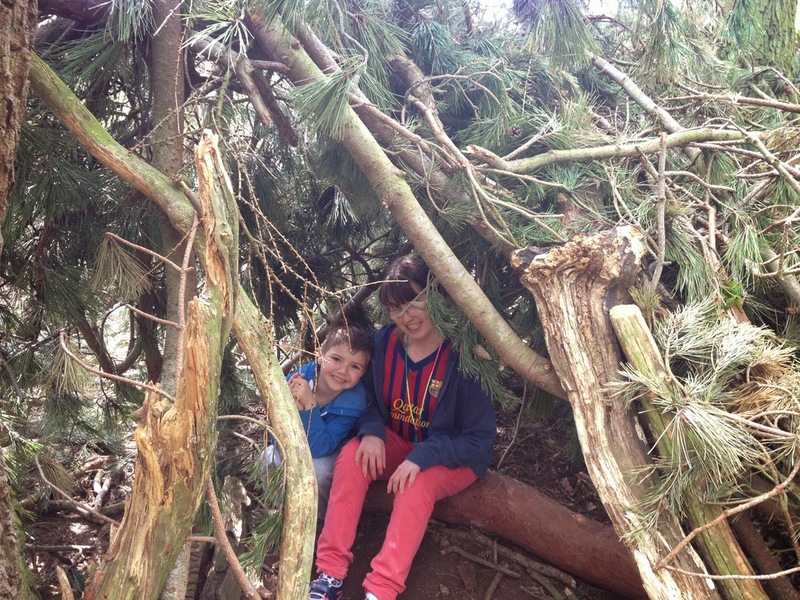 We went for a walk in the woods today, and discovered some impressive shelters made from logs, branches, twigs and ferns. Either Ray Mears had had an barney with his missis and was at a loose end, or the local scouts had been on a bank holiday camping expedition. Either way, some of these structures were better put together than most of my flatpack efforts from Ikea. I was still feeling a bit lightheaded* (*hungover) from a day of freedom yesterday. A complicated chain of babysitting arrangements, made months in advance, had allowed me and my husband to head off on a hedonistic day out. 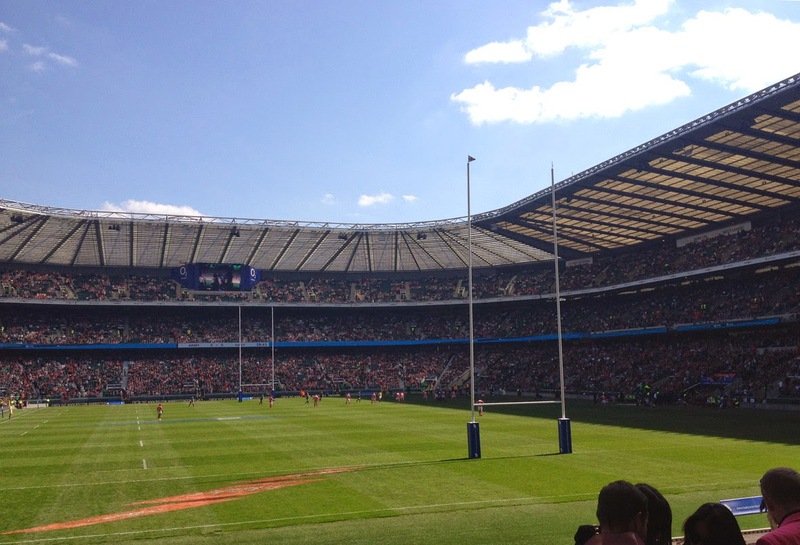 We joined up with some friends with naval connections* (*I now have this strange thought in my head of twins, attached to each other by umbilical cords, but that’s not what I mean at all) and hopped on a coach down to Twickenham to watch the annual Army v Navy rugby match. For a day we relinquished our responsibilities, and joined up with my big brother, some old pals we’d not seen for years, and a bunch of silly but very friendly people we’d previously never met (including two Popeyes and a Captain Haddock). We chatted, sang (very poorly, according to my brother, who has an encylopaedic knowledge of filthy songs and is baffled when not everyone knows the 16th verse), shared a luggage compartment of refreshing refreshments, and along with 82,000 people watched some blokes play with an egg-shaped ball. I can’t begin to explain how great it is to be responsibility-free for 12 hours or so. It’s a complicated process, sorting out a babysitter for more than a few hours for our daughter. It needs to be someone who knows her well, who understands her ways, who can administer the food and snack regime with ruthless efficiency, and who ‘gets’ her. Add her little brother into the equation, and they have be a mix of Mary Poppins and Supernanny. Luckily, my mate Kay, booked for yesterday's main shift, fits the bill. Thanks, Supermarynannypoppins. There’s few people in this world I trust more. She knows what’s important about friendship (Jesus, I’m not going to go all inspirational life-coach on you, so stay with me). She gave us the chance to have a frivolous day. And that’s a seriously brilliant gift. Chances are that everyone reading this has got someone they know who could do with a day off. Be a human KitKat, give them a break. They’ll love you for it. Video is The Decemberists - The Mariner's Revenge Song. Nautical, and fathoms better than In The Navy.